QRD – How old were you when you first realized you wanted to be a cartoonist? 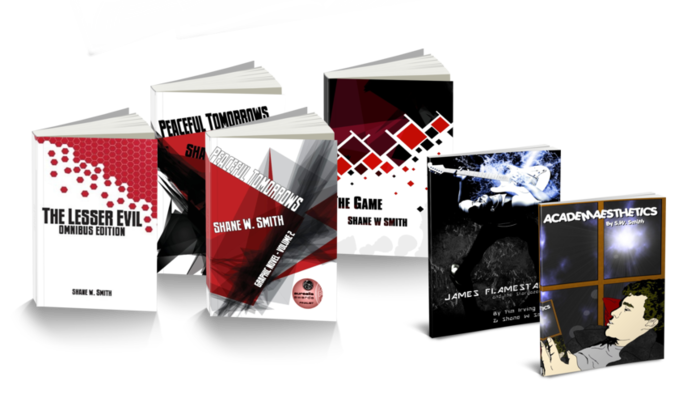 Shane – I’ve wanted to be a writer for as long as I can remember. Ever since I could hold a pencil, I’ve been writing stories. I got my first rejection letter when I was seven & accumulated something like a dozen more for my first novel. I went through a bit of a Joss Whedon fanboy stage in 2004-2005 that led me to pick up Fray, the first comic I’d read since I was a little boy. There was something about the way it flowed, the way it read, that made me feel like perhaps this was something I could branch out into. I guess I was around twenty at this stage. I’m a self-taught artist, but I think I’ll always be a writer first. QRD – What are a few highlights of your cartooning career? Getting a book published for the first time. Before The Lesser Evil was picked up by Canadian publisher Zetabella, I had gotten used to receiving rejections (or, just as commonly, no response). There’s nothing quite like that moment when you see a new message in your inbox, & you allow that little flutter of hope to stir in your diaphragm... & then the news is good & you have to read it about eight times to process it properly. & it happens all over again the first time you hold that book in your hands. Being short-listed in the Aurealis Awards twice. Two of my books have been short-listed in the Aurealis Awards, annual awards which celebrate Australian science fiction. Having books considered among the best produced in a year is a tremendous thrill, a nice ego stroke, & powerful validation for my decision to spend all of my leisure time over the course of many years devoted to this creative obsession. 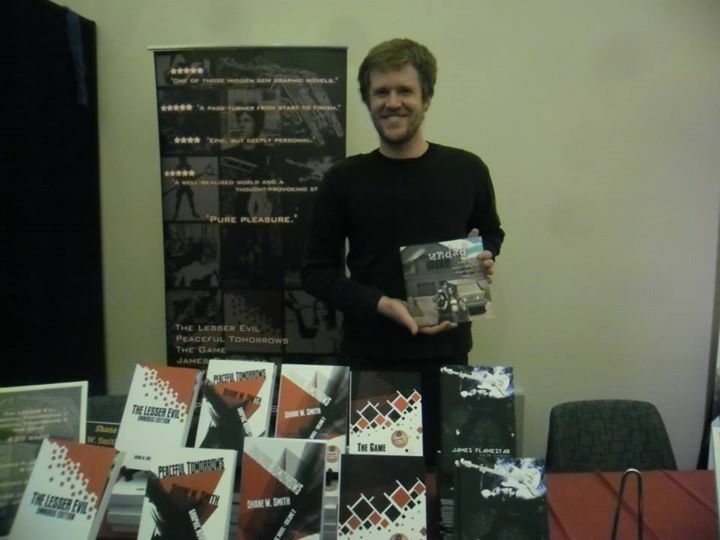 Selling books at conventions. Attracting an audience is a hard thing for an indie creator to do. As such, it feels like a big deal when you can make a complete stranger take a chance & splash down some cash in exchange for one of your books. & when they come back the next year desperate for the next title... it’s a pretty incredible feeling, knowing that your book was good enough to hook a complete stranger. But there are a bunch of other highlights, too. Making friends in the comics scene. 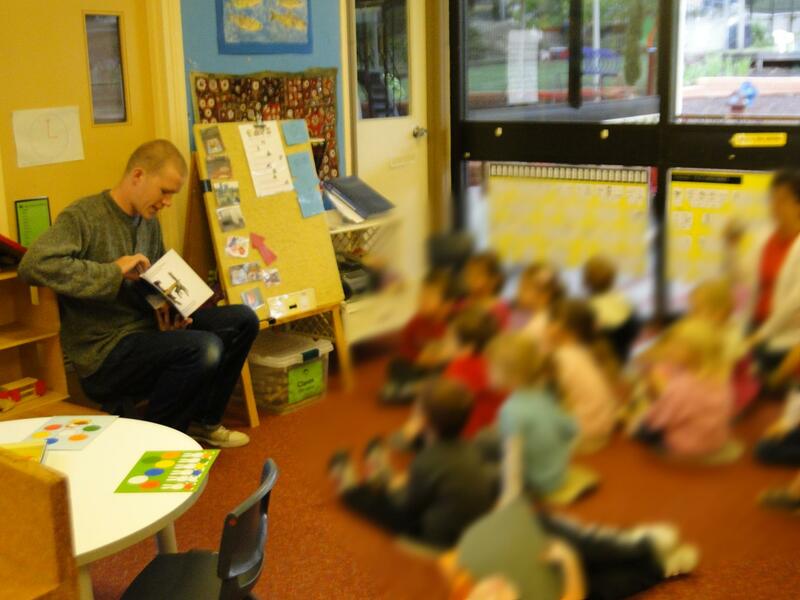 Conducting a public reading at my kid’s pre-school. Collaborating with incredibly talented artists. Learning about myself & what I believe, through my work. Shane – It was after I got married in 2008, for sure. My wife has wanted babies for her entire life & I wanted to make her dreams come true. Becoming a father was something that I’d always sort of assumed would happen for me... one day. I never really gave much thought to when that “one day” would come; I was still young & I had a writing career to get off the ground. I now have three kids: 5, 3, & 1. We had them for my wife, but I’ve benefited at least as much as she has from the experience. Shane – The first obvious drawback is the loss of free time. Having a family & a mortgage forced me to go into full-time work & having children at home meant that time to write was severely limited. I attended a seminar on time management for writers with families at around the time we had our first child & the guy laid some harsh truths upon the audience: you have to be willing to be a bad husband sometimes, to be an absent father sometimes, if you want to have enough time to write. That really didn’t sit well with me at all; I didn’t want to be a lackluster father & husband... but I wasn’t willing to let go of my dreams of becoming a professional writer either. I needed a third option. In the end, the compromise I made was to work late into the night, after everyone else had gone to sleep. It involved some negotiations with my patient & supportive wife, who agreed to be in charge of the baby all night. & I slowly trained myself to make do with less & less sleep. The positive impacts are more subtle, but no less profound. Having a family changes everything. It looks so cheesy in movies & TV when having a baby causes a character to “wake up & grow up,” but now I can see the underlying authenticity to such a premise. Everything changes – your whole outlook on life, for one. & I think it’s impossible for that not to migrate across into your writing. It’s a fresh new perspective, a more nuanced one, one in which the personal micro story finds its place in the macro tapestry of the world. Fatherhood was a legitimate tool to add to my writer’s toolbox & it made all my writing better almost immediately. Furthermore, becoming a family man has forced me to appreciate limited leisure time & teach myself rigid discipline. Since becoming a father, my writing productivity has increased many times over, simply because I’ve developed the discipline to sit down at my desk & make the most out of every minute I have to work on my books. Lastly, it’s opened doors you wouldn’t necessarily expect. For example, the first public reading of one of my books was not at a bookstore, café, theatre, or writing event. It was to the toughest audience known to man: a gaggle of three year olds at my daughter’s pre-school. Shane – You wouldn’t necessarily expect it, but being a writer does incur some costs. Especially in comics. If you’re collaborating with other artists, you’re paying them for the work they do & if you’re going the solo route, you’re always in need of supplies of one type or another. If you’re tabling at conventions, you need some money up front for travel, accommodation, the table itself, & the stock you’ll be selling. Chances are: you won’t be making all that money back, at least in the early days, & that loss is keenly felt in a young single-income family. As I said earlier, I’ve taken pains to reduce the time costs upon my family by writing after they’re all asleep, but this approach has costs of its own. Being short on sleep makes me quick to grump some days & the beneficiaries of that moodiness are most frequently my loved ones. Furthermore, it puts a lot more pressure on my wife, who is seemingly almost never off-duty when it comes to the children. If I’m needed, I’ll always help out, but she is always the one to have the first crack at diffusing a situation. In some ways I suppose I have already taken a couple of steps towards that “absent parent” I was advised about in that time management seminar. QRD – Have your children effected the comics you make &/or read? Shane – Well, you write what you know. Every book I’ve ever made subtextually reflects a point in my life, the challenges & triumphs of a particular stage of my growth as a person. In that sense, the answer is yes: having children has had an effect upon what I write, simply by being a part of my subconscious mind as I break a new story. In terms of what I read, I haven’t noticed any particular effect yet, although I am able to appreciate some of my favourites on a new level. QRD – Have you had problems with the lack of steady money from an artistic career providing the security you feel necessary in your household? Shane – Yes. I work a full-time job in the public service to make ends meet. At the stage my creative career is at, there’s just no other way to do it. QRD – Given the limitations having a family has on going on the convention circuit, would you have showed more earlier in life if you’d known? Shane – My first commercial publication came after I already had kids, so the question is somewhat academic. I’ve always sunk all my available free time into my writing, so I imagine that I probably would have exhibited as much as I could afford to. 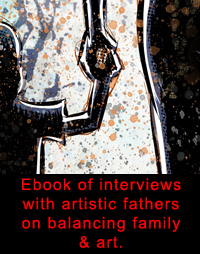 QRD – Do you think being a father or a cartoonist has a greater impact on your community? 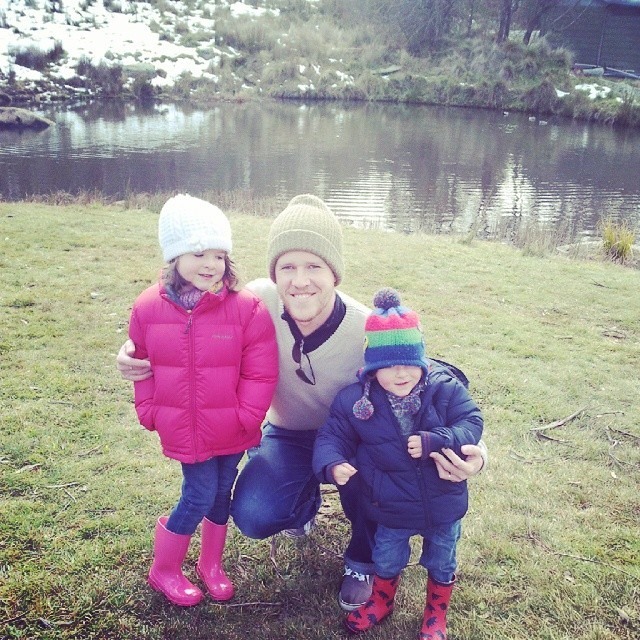 Shane – I have a small loyal readership for my books, but my kids are already taking steps to conquer the world... so it’s definitely fatherhood that’s making the bigger impact. QRD – Would you rather see your children eventually become cartoonists or parents? Shane – Parents. I think they’re going to all be walking their own path in life, rather than attempting to follow in my footsteps (or my wife’s), but parenthood is definitely something I’d like them to experience. QRD – Both family & comics seem like things that will take up as much of your time as you’re willing to put in. How do you end up dividing your time? Shane – I’ve covered this earlier on in greater detail, but in effect, it’s involved splitting myself, & my time, into silos. There’s work-Shane, who brings home the bacon; there’s home-Shane who spends quality time with his wife & kids & helps out a bit around the house; & there’s writing-Shane who works late into the night on passion projects & a long-term dream under construction. 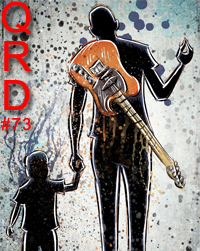 QRD – What do your kids think of your comics? Shane – The eldest is five &, although she’s a tremendous reader, I’ve told her she needs to be thirteen before I’ll let her touch my books. I’m currently exploring options to produce something a little more kid-friendly in the future. I wrote a picture book about her once; she was relatively ambivalent towards it. QRD – Do you think you could ever do a comic project with your children? Shane – I would absolutely love to, one day. Shane – Go after your dreams. Hard. No one will understand how badly you want them unless you can demonstrate it with hard work.